The Little Engineer and I enjoy taking what we read and acting it out in play. 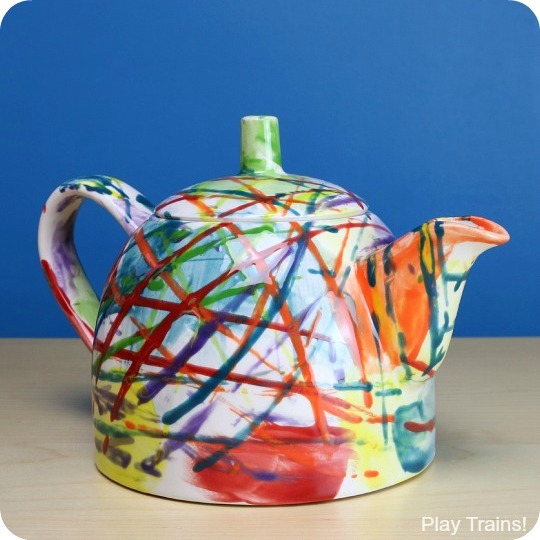 Often, this means playing it out with our wooden trains. (Big shock, I know.) I think there’s a lot to be learned from adapting a book to another form of storytelling. 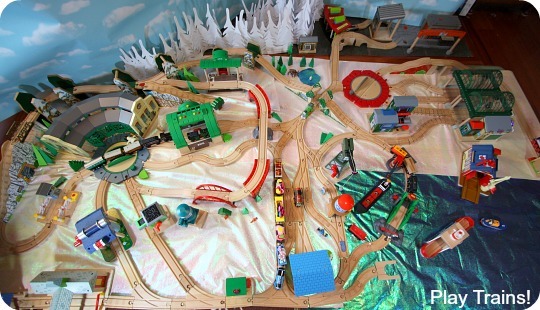 Also, we’re hoping the photos of our layout might be fun to share with your young train lovers. In addition to being a fun literacy activity, it turned out to be a great way to learn about maps and geography as well. An earlier version of this post was originally published on February 4th, 2013, when the Little Engineer was three years old. It contains links to Amazon.com. If you click on one, we will receive a small commission — at no additional cost to you — on anything you buy at Amazon for a certain length of time afterwards. Read our disclosure policy for more details. The Thomas in Town series of books have long been some of our favorite Thomas & Friends reads. 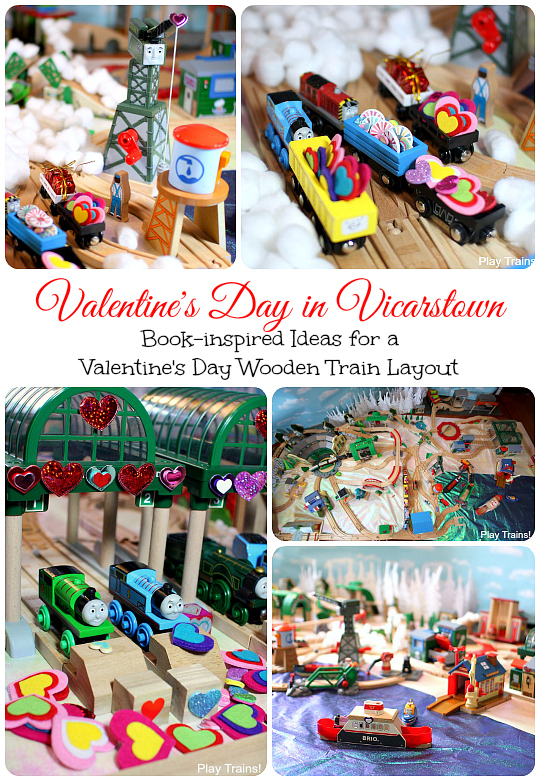 Each of the four titles — Halloween in Anopha, Christmas in Wellsworth, Valentine’s Day in Vicarstown, and Easter in Harwick — tells a holiday story set in a town on the Island of Sodor. In general, these books feature good, descriptive writing while avoiding many of the pitfalls of the recent seasons of the TV show and its related books (the much improved most recent season of the show excepted). The illustrations by Richard Courtney, my favorite Thomas artist, are especially lovely. 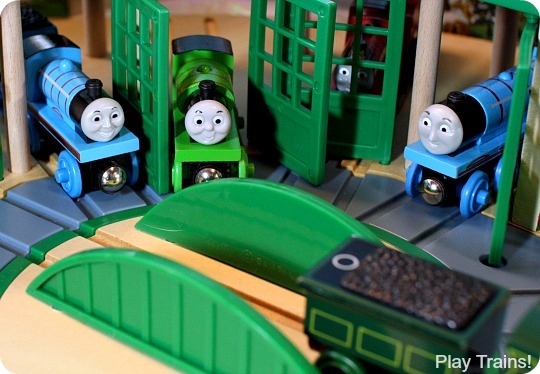 Next, Thomas asks Percy how his night went, but as soon as Percy begins to answer him, Thomas interrupts him to say that he has to leave right away to go work at Brendam Docks for a few days and chuffs away. He does apologize to Percy and promises to listen at the Valentine’s Day party in Vicarstown, but Thomas, why did you ask him if you didn’t have time to hear his answer? On the other hand, it really fits the way Thomas’ character comes across much of the time, and protagonists need flaws. I mostly find it funny, but I do like to point out to the Little Engineer that Thomas could have handled the situation in a different way. 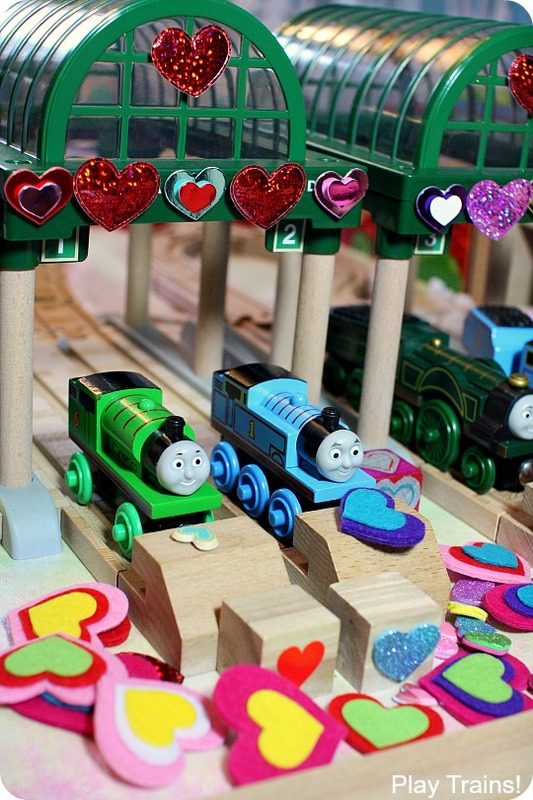 After Thomas leaves, Percy asks some of the more experienced engines about the Valentine’s Day party. True to their characters, Edward gives a helpful explanation, James brags about how many valentines he got last year, and Gordon claims to be too important for a Valentine’s Day party. 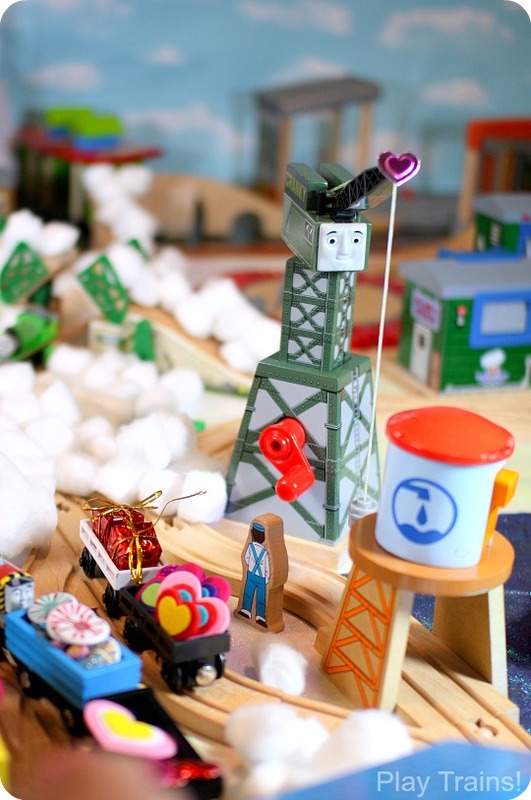 In the books, you don’t see Thomas at Brendam Docks, but we wanted to put it in the layout. First of all, it’s Thomas, so he wasn’t just going to disappear from the tracks while we were playing. And second, it worked out nicely with the geography of Sodor. Let’s take a look at the full layout from above. There’s Tidmouth on the left in the west coast of Sodor, and Vicarstown (well, really Knapford Station with its sign covered up, plus the retired Vicarstown Dieselworks tucked in the very back) on the right on the east side of the island. To the south of the mainline between the two towns are the Docks. This was a good opportunity to compare our layout with the map and talk about directions again, and also to talk about how our layout differed from the geography shown on the map. Another reason to add the Docks into the layout was to have that big sea area. 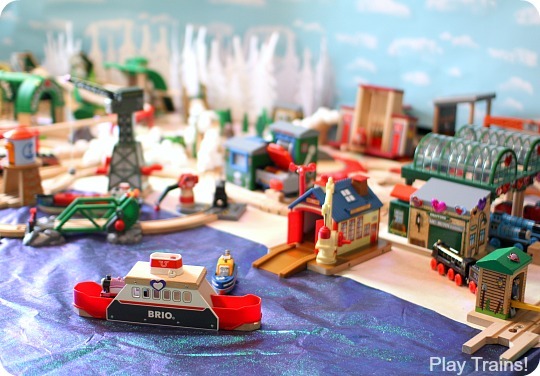 The Little Engineer had recently gotten a couple of really water-related presents for his wooden trains for his birthday, the Brio Ferry Ship and the Brio Cargo Harbor Set. I try to rotate room for them in and out of the layout because we both like playing with them, especially the awesome ferry. And finally, who could resist the opportunity to decorate Cranky? Especially for Valentine’s Day. He looks so happy with his little shiny heart there. Okay, back to the story in the book. The morning after a huge snowstorm, Sir Topham Hatt comes to the Sheds to tell Percy that Thomas is snowed in at the Docks, and Percy will have to try to use Thomas’ snowplow to clear the line during the day and pull mail cars at night. After the snow storm, we added cotton balls to the layout (a fun trick I picked up from No Time for Flashcards’ Winter Train Table Sensory Play post). 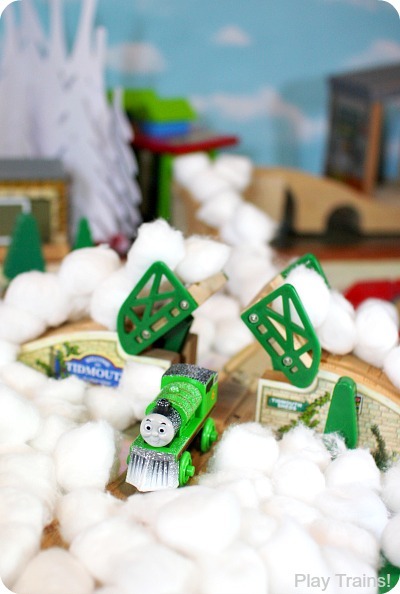 And off goes Percy wearing Thomas’ snowplow. It’s slightly too big, but Percy tries and works his hardest, and helps the bigger engines clear the snow from the line. This Snow Covered Percy with a snowplow was my Christmas gift from the Little Engineer and his dada. 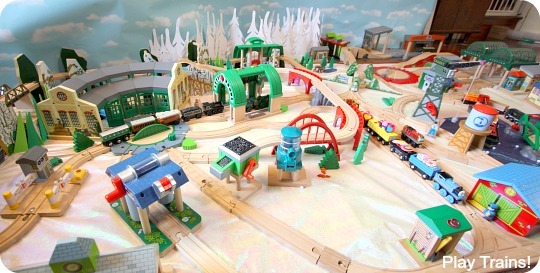 I really wanted it (you’ll notice I said “our wooden trains” way up at the top), but normally it’s only available as part of the massive (and expensive…especially now that it’s retired) Rumble and Race Mountain Set. Thanks to eBay, my husband tracked it down as a far less costly addition to the collection. However, a regular Percy (or a different train entirely) would be fine! It could be fun to try to make a snowplow for him out of blue Play Dough or construction paper. A blue one because it’s supposed to be Thomas’ snowplow; I’m still not sure why the wooden trains’ snowplows are boring gray. Meanwhile, here’s Thomas snowed in at the Docks, still hard at work shunting Troublesome Trucks in the snow because…well, what fun would it be to let him rest? The book doesn’t say why the Docks were so busy that Thomas would be there for days, so I filled in the blank with something fun and fitting to the story, if not the reality of what real trains might really pull. Sodor has very little to do with reality, after all. 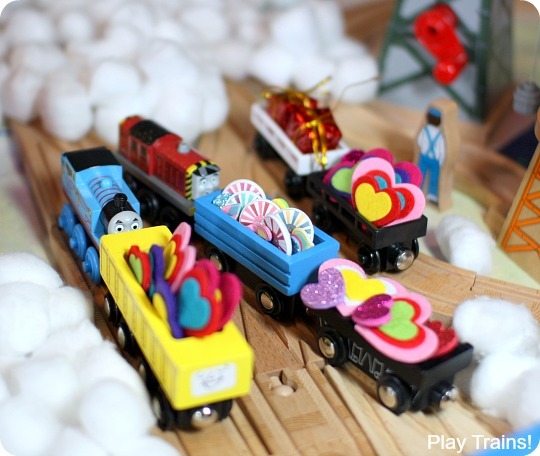 We made all of this freight following the steps I explained in Easy DIY Valentine’s Day Freight for Wooden Trains, and it turned out so cute. 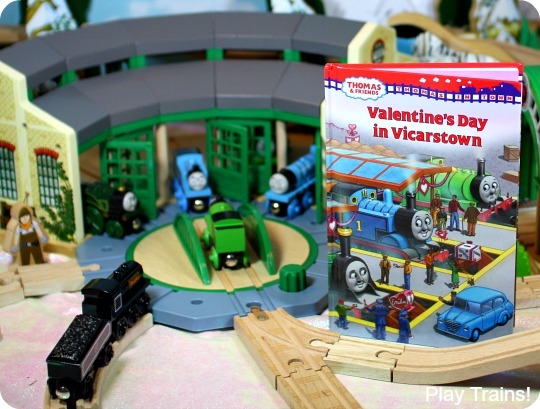 Finally it’s Valentine’s Day, and Percy arrives at Vicarstown Station. 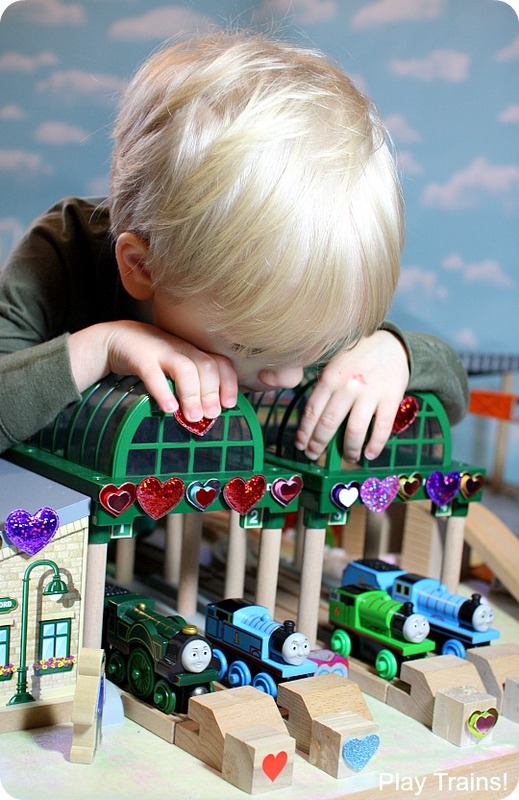 When he sees his valentine mailbox the tired little engine worries that there’s more mail to pull. His driver explains what’s going on. Then Percy worries that Thomas won’t make it to the party. For the mailboxes, we used some wood blocks from the craft store and with various heart stickers attached. As you can see, we had fun decorating the station for the party. These were all stickers out of the dollar bins at Target. 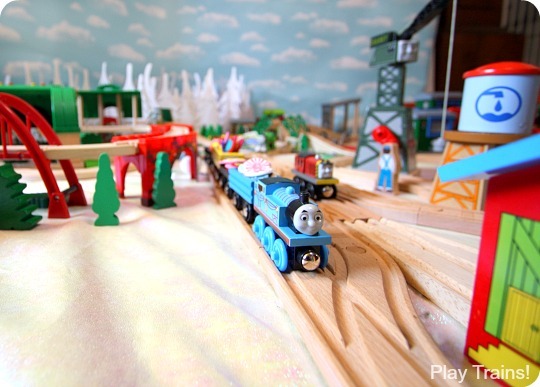 You can read about my secret for decorating wooden trains and accessories without damaging in Damage-Free Decorating for Wooden Train Layouts. Sir Topham Hatt addresses the crowd: high grade coal and wash downs for all his “Really Useful valentines” — hooray! Then the children sing and exchange valentines and chocolate hearts and fruits. I think we’ll do some of that when we play through the story again later this week. I really wish I had more little wooden train people who could pass for children. 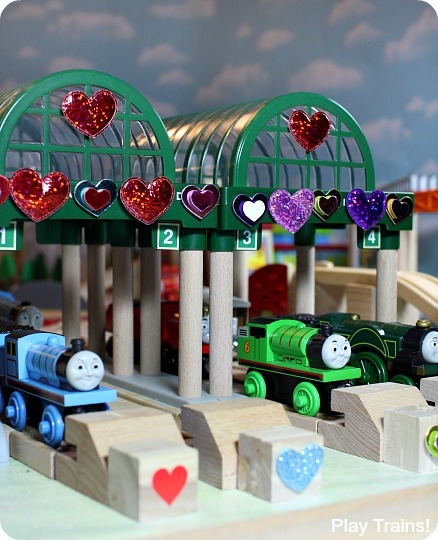 However, it’s natural for Percy, who is supposed to be one of the youngest engines and represent that level of maturity, to be excited by having the most valentines. And what comes after that line is possibly the more important part. 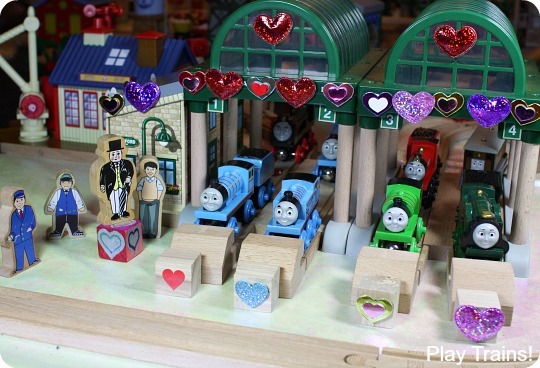 The valentine that puts him over the top comes from Sir Topham himself, in recognition of Percy’s dedicated work plowing the tracks by day and delivering the mail by night. Percy earned that last valentine by going above and beyond his normal duties, and doing so without complaint. And then, the last two paragraphs of the book are about Thomas’ reaction. Thomas isn’t jealous at all of Percy, neither for winning the valentine count nor the praise from Sir Topham. 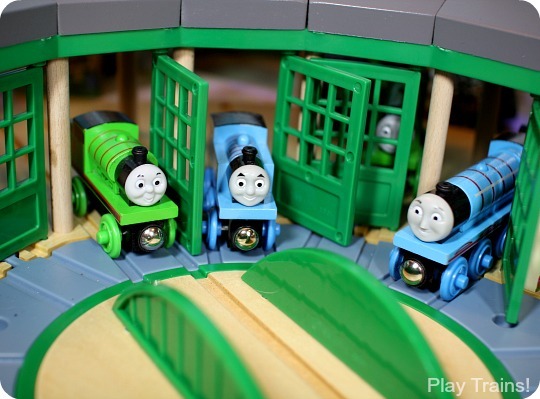 In response to Sir Topham commenting that Percy is pretty good with Thomas’ snowplow, Thomas laughs and offers it to Percy. And then Percy smiles, feeling lucky that Thomas is his friend. Which is, of course, the overarching theme of the book: friendship, and reconnecting after some distance — both real and metaphorical — comes between two friends. Thomas sort of brushed Percy off at the beginning, and Percy seems a little uncertain and sad through the book (something that is subtly handled through the illustrations in many places), but their value and bond as friends is reestablished at the end. I think the Little Engineer’s favorite part of playing out the story was the party at the station. I had started setting it up while he was still shunting valentine freight with Thomas and Salty. When he noticed what I was doing, he came and took over, removing some of the engines I had put in the background who he didn’t think would be at the party and rearranging the valentine mailboxes and the engines in the front row. Then, without being reminded of the story by me, he started setting valentines by the engines and counting them. Of course, in his version, Thomas got most of the valentines. His other favorite part of the process — and I don’t have a picture of this, sadly — was playing with the two full spectrum desk lamps I was experimenting with to help light our layout for the photos. I’m not sure if they were two suns or if one was the sun and one was the moon because he was talking so quickly, but he was very excited about turning them off and on and holding them up above the trains. One last thing I included was the Sodor Engine Wash (bottom left above), so that the engines could go get their celebratory wash downs at the end. Wash downs are extremely important to engines, if you ask the Little Engineer, so there was no way we were going to leave them out when they were mentioned. 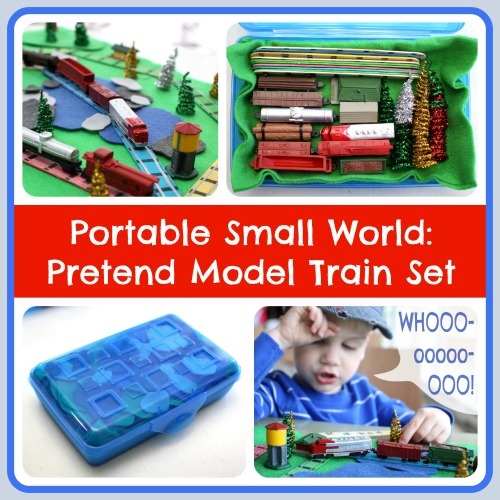 Fortunately, they can be satisfactorily accomplished with just a cloth to “scrub” and polish the wooden trains. So, that’s our take on Valentine’s Day in Vicarstown. I hope you enjoyed it, because we enjoyed creating it. For another activity based on the book, check out how we used the story to practice counting. 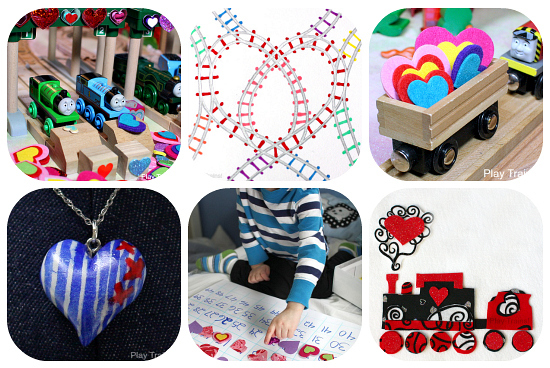 A pretty and engaging felt train play set that’s quick and easy to make for Valentine’s Day. 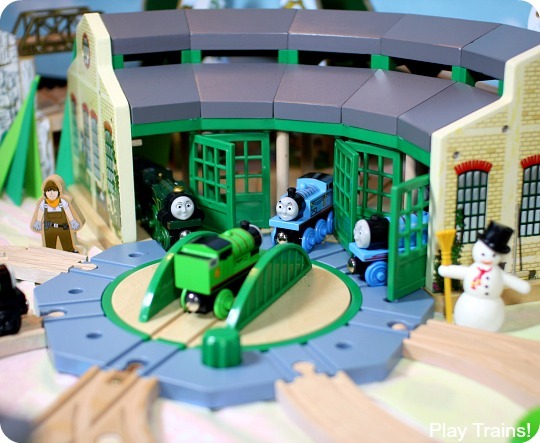 WOW that train layout looks like so much fun. I just love how everything is all ready for Valentines day. Great job! Thanks for sharing on We Made That. Thanks! We’ve been enjoying it. My 4 year old would love everything in this post! Thanks for sharing at The Children’s Bookshelf. Impressive! My eldest daughter used to love Thomas, she even had a THomas themed party for her 3rd Birthday! That’s great! We’ve had two Thomas birthday parties so far. I’m saving the decorations just in case we go for a third round. How fun! I love all of the details. And your pictures are fabulous! Thanks for Sharing with us at Share It Saturday! WoW!! You go mom! That is great! Freight and decorations and mailboxes and cotton ball snow blizzard!!! This is just cool. Thanks! It was a lot of work, but we enjoyed ourselves. I love how you decorated the trains and station! What a great way to retell as story. I am going to share this post on the Read.Explore.Learn. Facebook page and Pinterest board. Thanks for sharing the link! We did another activity to go with the book today. Hopefully I’ll get that one up soon.